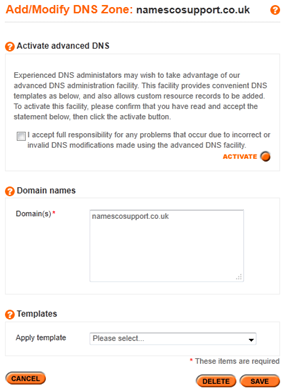 From the this screen you can select one of Namesco's preset DNS templates. So, if your domain uses our services entirely, this is likely all you will need. Simply select one of the templates from the drop down menu next to Apply template then select Save. The drop down menu will revert to say Please select... however, this will have saved your template choice. The alternative screen you may see, is for those that have activated advanced DNS. This offers the same options as the basic DNS screen, plus the ability to set individual DNS records, as you can see in the screenshot below. 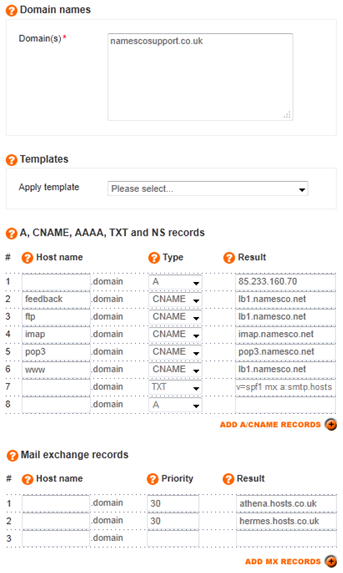 In the section entitled A, CNAME, AAAA, TXT and NS records you can create host name records to point to any location you wish. To create a record, enter the text you wish to appear before your domain name in to the Host name field. Change the Type option to the required record type you wish to create, then add the destination address in the Result field. To create this, you would enter webmail in to the Host Name field, set the record Type to A and enter 192.168.0.5 in the Result field. 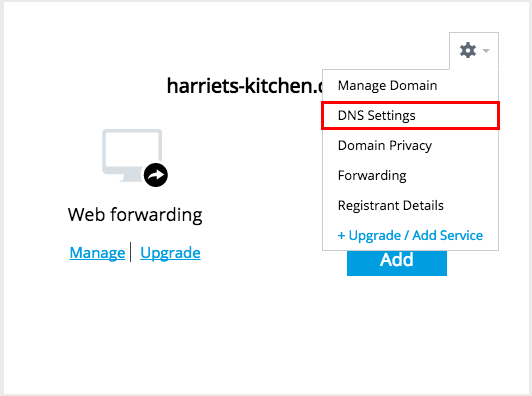 To confirm any changes to your DNS configuration select Save which you will find at the bottom of the screen. Please note that due to DNS propagation, any changes made to your domains DNS configuration will take up to 48 hours to take effect. If you do not feel confident to make DNS changes, please raise a support ticket through your Online Control Panel. Our Support team will happily assist you with your changes.